Chris Harris is back in the Panthers side for the visit of Glasgow. 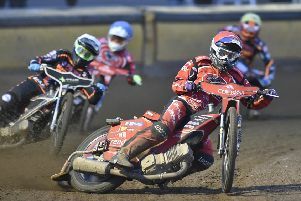 Peterborough Panthers boss Carl Johnson is predicting another thriller at the entertainment capital of British speedway today (June 25). Panthers will attempt to spark a surge up the SGB Championship standings by claiming the notable scalp of title-chasing Glasgow at the East of England Arena (5pm). Panthers team boss Carl Johnson (centre) is expecting another thriller at the Showground. Johnson is convinced another classic contest awaits at a venue which is producing breath-taking racing on a regular basis. And he insists it is essential that Peterborough follow up a Friday night success against bottom side Berwick by sinking their teeth into the Tigers. Johnson said: “There is not another track in the country that consistently serves up the entertainment we see here. “There’s rarely a dull race, let alone a poor meeting. Our supporters really are being spoiled and hopefully more and more people will come along to see it for themselves. “But we’re also in a results-based business and we know we haven’t won enough fixtures so far this season. “We had a good victory last week against Scunthorpe and failed to follow it up against Sheffield a couple of days later. Peterborough are at full-strength with number one Chris Harris returning to the side after missing the success against Berwick due to an SGB Premiership engagement. Glasgow race for the second time in 24 hours. They climbed back into second place by beating Ipswich at Ashfield last night. And while many pundits believe the Tigers are blessed with the strongest heat-leader trio at this level in the shape of Richard Lawson, Richie Worrall and Aaron Summers, Johnson believes Panthers possess more main body muscle. He added: “A lot has been made of Glasgow having the best top three in a team, but Danny King won races again them last night for Ipswich and I’m confident we have guys who can do the same. “We have a proven performer in Chris at number one and no rider in the world is in better form than Jack Holder right now. “We’ve got three other capable guys in Paul Starke, Ulrich Ostergaard and Bradley Wilson-Dean and I feel our top five is stronger than that of Glasgow. “We’ve also got a rider in Tom Bacon who is improving all the time at reserve and starting to score important points. PETERBOROUGH: Tom Bacon, Richard Hall, Chris Harris, Jack Holder, Ulrich Ostergaard, Paul Starke, Bradley Wilson-Dean. GLASGOW: Dan Bewley, Richard Lawson, Nike Lunna, Tom Perry, Jack Smith, Aaron Summers, Richie Worrall.